Tell a Dalal Street broker to buy a petrol automatic and he'd probably whack your head clean off your shoulders. Not paisa vasool! Spark ignition engines and automatic transmissions are never a compatible match in developing nations. In India cars that used the combination in the lower segments had a very short shelf life. This was, strangely enough, not a problem with more expensive cars, but they were diesels and the more affluent couldn't be bothered with shifting a stick umpteen times. For the less affluent the problem has always been efficiency. A petrol automatic car just wasn't an affordable ownership experience. And yet we have almost every manufacturer in the C-segment offering the same. Honda has the City automatic, Hyundai offers the Verna while Skoda and Volkswagen have the Rapid and the Vento respectively. It's a fairly crowded space, isn't it, for a choice of car that almost everyone considers makes little economic sense? And so, why then did even Ford jump into this segment with the automatic Fiesta? Why is this segment getting popular and does it make sense? To find those answers we compared the new Fiesta automatic with the Honda City, still one of the most popular choices in the sedan segment and the Skoda Rapid (which shares everything but its nose with the VW Vento) a car that has rapidly and firmly impressed us with its blend of elegant understated style and strong performance. This is one test where the answers don't just crop up automatically! Beginning with the car that's on everyone's lips at the moment, the Ford Fiesta. The automatic transmission is a dual clutch system, a first for the segment as no one has managed to make this type of gearbox affordable yet. We see the dual clutch transmissions on several of the Volkswagen Group cars, but those are premium cars where the price you pay at least used to justify the cost of technology such as the dual clutch system. Interestingly that argument no longer holds much water and it shouldn't be too long before the tech trickles down to the less expensive cars. But of course Ford will enjoy first mover advantage if they manage to make all the right noises with this transmission. This 6-speed automatic known as the PowerShift is developed by Ford Europe in association with technical partners Getrag and is manufactured in Mexico. The transmissions are then imported to several nations such as India before they are put in to the Fiesta. The PowerShift was designed primarily as a part of Ford's endeavor to reduce fuel consumption and greenhouse gases by nearly 30 per cent by 2020. In fact Ford has committed that by 2013 almost 100 per cent of its transmissions will be advanced 6-speed transmissions, though what the breakup between manual and automatic is going to be like is uncertain. What is certain is that we will see more of this technologically rich transmission in the future. It utilises six forward ratios and a few other technologies to enhance the driving experience. So you also get hill climb assist and grade assist. Hill climb assist basically ensures your vehicle does not slide backwards if you come to a halt on an incline. Grade assist ensures smooth roll off in bumper to bumper traffic without any of the initial jerkiness and roughness that is usually associated with dual clutch automatic transmissions. The Fiesta automatic then is quite impressive in operation. The abilities of any engine can only be fully unleashed when it has the right gearbox to complement it and the Fiesta's slush box is a good mate to the Fiesta's 1.5 engine. So acceleration is quick and on the upshift gears change quickly thanks to a low shift point. However this sort of linearity is restricted to only when you want to draw the most amount of fun out of the engine. In moderate traffic the transmission is a bit moody and given to bouts of incoherent behaviour. It won't upshift when you want to, it downshifts rapidly shaving at least two gears off when you brake but then refuses to upshift or generate momentum quickly enough. Overall though this transmission is intensely quick from a standstill. It blazes through our acceleration tests in a most un-automatic-like fashion. This sort of acceleration ideally reflects the virtues of a dual clutch system. It should also be quick in a roll on acceleration test but unfortunately as I mentioned just a few lines before it isn't. The transmission is also refined but only at higher revs. At parking speeds there is some noise though it isn't loud enough to be a disturbance. That sound is a bit like a CVT but only not entirely whiny. As the revs climb it smoothens out and gets much quieter. One aspect that did disappoint me is that despite being a dual clutch system there is no manual selection of gears. You don't have paddles behind the steering wheel neither is there a Tiptronic like shift selector slot in the transmission gate. While most situations will not demand you ever having to change a gear manually, those looking for a bit more enthusiasm will miss preselecting a gear to keep the engine ticking in its power band. The gear selector however allows you to shift into a L mode where you can hold a lower gear without the transmission upshifting. It's a critical feature and comes in handy when you are climbing down a steep incline and don't want the transmission shifting up and reducing engine braking. This transmission is mated to a 4-cylinder 16-valve DOHC 1.5-litre petrol engine. Power is a healthy 109PS and torque 140Nm. In contrast the City has a standard torque convertor 5-speed automatic that is slick and quick at the same time. It's a refined transmission with no vibration and harshness. Neither do you hear it working except for the kick downs which you feel as a tug rather than hear the cogs changing. The City also has paddle shifts, a personal favourite feature, and it makes driving this car or any other much easier. Now the transmission isn't quick but you can pre-empt that by reading the conditions and shifting a few seconds before actually needed. It's quick on the upshifts, probably not as quick as the Fiesta but the difference is negligible in cars that are used as daily commuters rather than performance sedans. There is a sport mode that changes the shift points and using the paddles shifts it into a manual like mode and allows you to hold the gears. The Rapid represents not just itself but also the Vento. In essence they are both the same car, only wearing different badges and sporting slightly different design details. The Rapid impressed us in a big way when it came in for a test just three months ago. We liked it because it was and is one of the finest and quietest 6-speed automatic transmissions in this segment. Not only is it silent, its performance is truly linear and progressive. You never ever get the sense that the power and torque from the 1.6-litre engine is waning. It's alert, shifts quickly and has impressive performance. It's one of the few cars within the Skoda brand and under the VW umbrella that does not have a DSG (dual clutch) gear box yet it is impressive! But I also feel the transmission could have been geared to utilise the class leading torque figures the Rapid possesses. But feel is one thing, it's the actual numbers that give the game away. The Fiesta then isn't what we expected because it is impressive, more than its manual geared counterpart. That automatic transmission is flexible and so enthusiastic it helped the Fiesta do a 100kmph in just 13.9 seconds. In comparison the City which also has the most powerful engine is the quickest at 12.3 seconds while the Rapid the slowest at 14.6 seconds. Coming back however to the thoughts I shared at the begining of this story. No matter how hard I try to convince that stock broker that a petrol automatic is definitely worth the money, he'd still try and convince me otherwise. So here's where the fuel efficiency of these cars comes to my rescue. The least efficient in this pack is the Skoda Rapid. In the city it gets a best 9.1kmpl but stretches it on the highway to 16.1kmpl. That amounts to an overall average efficiency of 10.9kmpl and with the 55-litre tank (largest in the class) provides a range of 628km. The City is up next and while she is the quickest she isn't too bad where efficiency is concerned either. City figures show a decent 10.2kmpl and highway driving indicates 17.7kmpl. This gives an overall 12.07kmpl and a range of around 510km with its 42-litre tank. 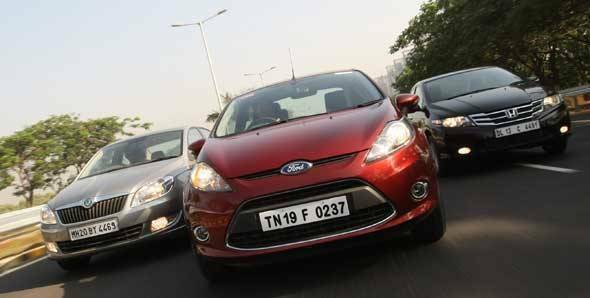 The Fiesta turns out to be the most efficient which isn't surprising because it's been one of the strongest characteristics of this car. The dual clutch system's primary role as I mentioned was to reduce fuel consumption. Having six gears then, matters. This transmission is certainly more efficient than the traditional automatic gearboxes because it does not need the heavy torque convertors or planetary gears. The twin clutch gearboxes also exhibit less slippage and transmission losses than conventional automatics. The dry clutch system also eliminates the need for heavy pumps, hydraulic fluids, cooling lines and external coolers. That brings the weight of the PowerShift transmission to around 73kg, which is roughly around 15-20kg lighter than a conventional 4-speed automatic. This is what helps the Fiesta cover 13.18kmpl in the city which is class leading. On the highway that extends to 17.9kmpl leading to an overall figure of 13.18 kmpl. Range thus comes to 566 km with a 43-litre fuel tank. Now the Fiesta may not show the same range as the Rapid because the fuel tank is smaller but rest assured the mileage you get from each drop of petrol is definitely higher. The one that comes in last is the Rapid but that does not make it a loser. Its automatic transmission is refined. It has a Tiptronic option so you can choose to exercise control over it if required. And it's also one of the cheapest automatic transmission sedans you can buy. But it's not the most efficient and neither is its operation entirely predictable and linear. You'd opt for this for the other attributes it has, such as the plush ride quality, fit and finish, high quality levels, stability and poise at all speeds and the entire driving experience in general. The winner in this one then is easy, and it isn't the Fiesta it's the City. Yes it may sound strange but consider this, the gearbox is smoother, more refined. It has a sport mode that spices up the car and shift quality is slicker and feels more progressive than the Fiesta. You also get paddles behind the steering wheel that allow better control over the shifts. It's also nearly as efficient as the Fiesta though performance is definitely better. And then there are the other value adds that the City provides such as the smarter design and style bits, superior interior space and the comfort and luxury aspect which is top notch (it's the only car here to offer a fully flat floor for rear seat occupants), impressive ride quality, precise steering and of course the higher resale value it commands. It isn't, however, as if the City dismisses the Fiesta into second place. For one, cars such as the Fiesta are certainly helping Ford achieve its goals of reducing pollution and improving efficiency. Another remarkable achievement is the fact that to date there has not been a single manufacturer to offer a dual clutch transmission system at this price point. And at Rs 9.7 lakh ex-showroom, Delhi that is a very attractive price to pay for the top of the line automatic. But all of that isn't enough for a win. And it's simple to see why. What the Ford lacks is the interior space becoming of a car at this price point. Then there is also luxury appeal, which is lacking. The Fiesta though has a long list of features which includes Bluetooth connectivity and voice commands. But the entire package does not feel expensive, it does not reach out to those looking at achieving their aspirations. It does not have the premiumness nor the quality which are very apparent in the way the various details within the cabin feel. And neither does Ford's Kinetic design look very moving, both on the outside and in. It in fact sorely loses out to even the Rapid in this regard which just oozes solidity and premiumness from every pore. The Fiesta then while still a feast could do with some more colour.